Natural curls should make your life easier, not harder. Unlike thin, flat hair or uneven waves, the style is there—it just needs a little taming. Even the lazy gal can swap her go-to messy bun for perfectly structured curls. With the right routine and products, you can work your way to effortless hair (with zero touch-ups required) in as little as ten minutes. Now, put the straightener down and listen up! Although washing your hair at night may seem like it saves you precious time in the morning, it actually adds extensive styling to your routine. “I recommend washing your hair in the morning because you’ll get a better curl pattern with air drying without creating matted or frizzy curls caused by your pillow and movements while you sleep,” says got2b celeb stylist Larry Sims. If you must wash at night, take precautions. “Once your hair has dried, tie the hair loosely on top of your head at night.” The less friction, the less frizz. And don’t use just any shampoo. Always opt for a sulfate-free shampoo, like ORS Lavish in Lather Sulfate-Free Shampoo ($10.99, sallybeauty.com) or Go Pro Curls by Larry Sims Frothie Shampoo ($13.99, smoothnshine.com). Sodium laurel sulfate, which is found in most shampoos, is a salt and detergent. As you can imagine, it’s effective in removing dirt and residue, but it also strips the hair of essential oils. Curly hair is naturally drier so sulfate-free options hold onto that much-needed moisture while cleansing. “After washing your hair, I suggest using curl enhancing products that lock in moisture—curly hair tends to have less moisture so it’s important to use a strong, healthy conditioner and products that contain a ton of moisture,” says Sims. Cantu Shea Butter Coconut Curling Cream ($7.29, walgreens.com) adds intense moisture while also healing dry, damaged hair with a blend of coconut and shea butter. Got2b Kinkier Gloss ’n Define Curling Mousse ($5.99, drugstore.com) adds moisture as well as style. The thin, non-hardening mousse holds in each strand’s original curl without weighing down the hair. Regardless of the brush type, they fray the hair and ruin the curl’s natural shape. The friction is also prone to creating frizz. Instead, always scrunch curls with your fingers for optimal shape. Don’t feel obligated to use a diffuser everyday—air drying has its perks too. “I suggest using a diffuser when you’re on the go and in a rush or if you want tons of volume quickly,” says Sims. “A great way to diffuse hair is to lightly touch your hair as its dries, scrunching the curls and creating curl enhancement.” Opt for a diffused look when you want to change it up without resorting to an hour-long ordeal with the flat-iron. And turn down the heat, going no higher than 400 degrees. 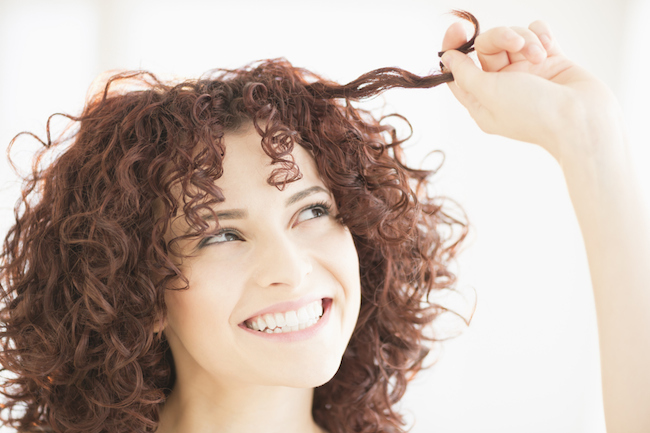 Excess heat will damage the natural proteins that give spiral curls their shape. When curls act up, you don’t have to start from scratch. “The less you touch your hair, the less frizz you’ll have and the easier it’ll be to keep your tamed, textured curls.” Even when wearing coarse clothing, such as scarves, sweaters and coats, avoid as much contact as possible to prevent friction. If the hair does start to frizz, dab your hands with water and lightly scrunch to add in moisture.